American home cooks can be a bit unimaginative when it comes to eggs, limiting them mostly to the breakfast table. But the rest of the world turns to eggs throughout the day — and makes them the star of the plate, not an afterthought. 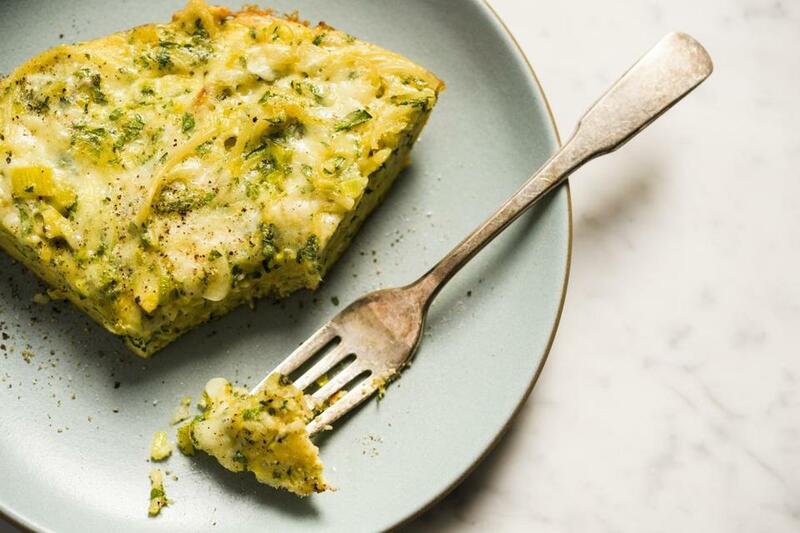 Mixed with pasta, they’re bolstered by fresh herbs and savory cheese in our Pasta, Thyme, and Parmesan Frittata. In our Baked Persian Herb Omelet — no tedious flipping needed — we use 5 cups of fresh herbs to lighten and brighten the dish. And in our Cambodian take on the omelet, shiitake mushrooms, ground pork, and fresh ginger add deep, savory notes. 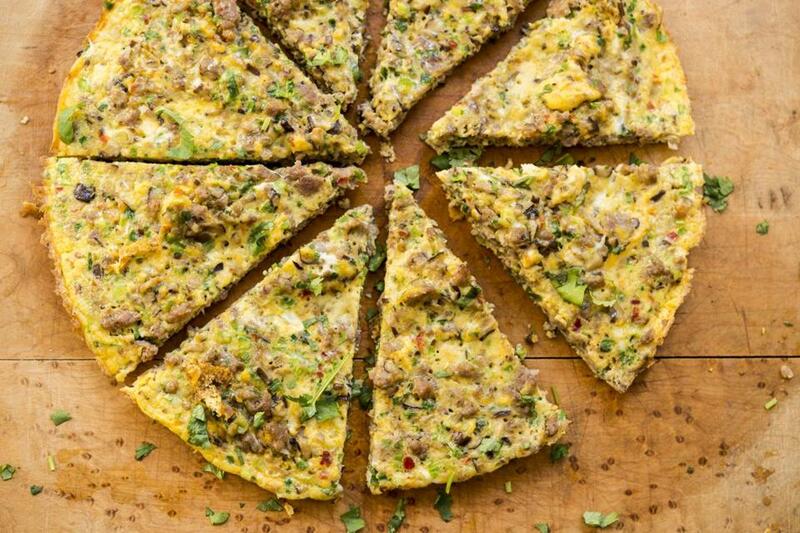 For ease, the frittata and the pork omelet finish in the oven, ensuring perfect, even cooking. Italians are known to use leftover pasta as a filling for frittatas. Here, we cooked spaghetti or bucatini (a tubular pasta similar to spaghetti) for a frittata enriched with cheese and seasoned with parsley and thyme. For the best flavor and texture, we used two kinds of cheese: Parmesan for its salty-sweet nuttiness, and sharp or extra-sharp white cheddar for its creaminess. Gruyère is a good alternative to cheddar. Don’t forget to rinse the pasta after draining. Rinsing halts the cooking so the pasta won’t continue to soften as it waits to go into the skillet. And don’t use a conventional skillet. A nonstick coating allows the frittata to slide effortlessly out of the pan. Make sure the skillet is oven-safe, as the frittata finishes cooking in a 350-degree oven. Heat the oven to 350 degrees with a rack in the upper-middle position. In a medium saucepan, bring 2 quarts of water to a boil. Add the pasta and 1 tablespoon salt, then cook until the pasta is al dente. Drain, then rinse under cold water. Spread the pasta on a paper-towel-lined plate and set aside. In a large bowl, whisk the eggs and ½ teaspoon each salt and pepper. Stir in ¾ cup of the cheddar, the Parmesan, parsley, and thyme. In an oven-safe 10-inch nonstick skillet over medium, heat 3 tablespoons of the oil until shimmering. Add the garlic and cook, stirring constantly, until fragrant, about 30 seconds. Add the leek and ½ teaspoon salt. Cook, stirring, until softened and lightly browned, about 6 minutes. Transfer to another plate and let cool for 2 minutes, then fold into the egg mixture. Wipe out the skillet, add the remaining 3 tablespoons oil, and heat over medium until shimmering. Add the pasta and stir to coat. Pour the egg mixture over the pasta and fold with a silicone spatula. Continue to gently fold and scrape the sides of the pan, allowing the uncooked egg to flow to the sides. Once the eggs begin to thicken and set, after about 1 minute, smooth the top and cook the frittata undisturbed until the bottom is deep golden brown, another 3 minutes. Sprinkle with the remaining ¼ cup cheddar and transfer to the oven. Bake until the eggs are set at the center, 10 to 15 minutes. Let cool for 5 minutes. Run a silicone spatula around the edge and underneath the frittata to loosen, then slide onto a serving plate and cut into wedges. Baked Persian herb omelet (kuku sabzi). Baking this Persian egg dish — treating it more like a cake than an omelet — let us skip the tedium of stove-top frying and flipping. Pulsing the herbs and scallions in the food processor was easier and faster than hand chopping, and the texture was better. Dried cranberries were a good stand-in for traditional Persian barberries — lending a sweet and savory balance — but the recipe also works without them. Don’t use less than the 2 tablespoons of oil to grease the pan; it should pool at the bottom and generously coat the sides. It crisps the edges and boosts the omelet’s flavor. Heat the oven to 375 degrees with a rack in the upper-middle position. Trace the bottom of an 8-inch-square or 9-inch-round cake pan on kitchen parchment, then cut inside the line to create a piece to fit inside the pan. Coat the bottom and sides of the pan with 2 tablespoons of the oil, turning the parchment to coat both sides. In a food processor, combine the parsley, cilantro, dill, scallions, and the remaining 3 tablespoons of oil. Process until finely ground. In a large bowl, whisk together the baking powder, salt, cardamom, cinnamon, cumin, and pepper. Add 2 of the eggs and whisk until blended. Add the remaining 4 eggs and whisk until just combined. 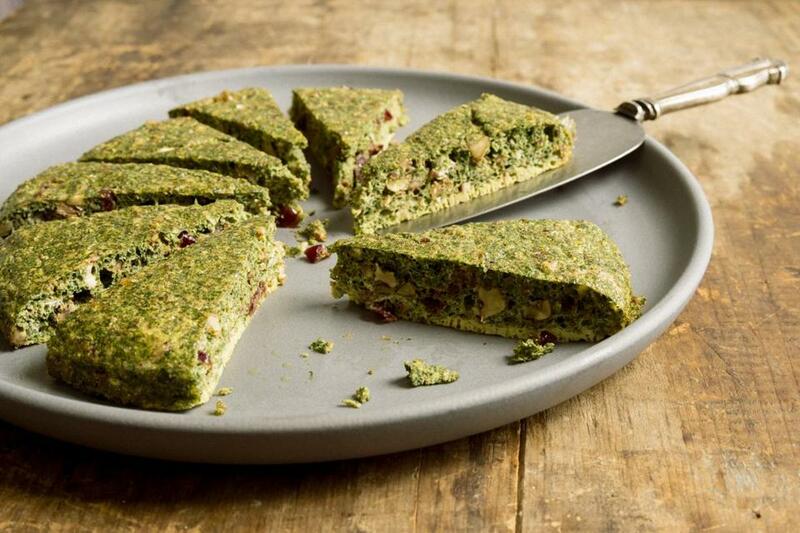 Fold in the herb-scallion mixture and the walnuts and cranberries, if using. Pour into the prepared pan and smooth the top. Bake until the center is firm, 20 to 25 minutes. Let the omelet cool in the pan on a rack for 10 minutes. Run a knife around the edges, then invert onto a plate and remove the parchment. Reinvert onto a cutting board or serving platter. Cut into wedges or squares and serve warm, cold, or at room temperature with a dollop of yogurt, if desired. The omelet can be refrigerated for up to 3 days, tightly wrapped. This rich, frittata-like omelet is delicious hot, but we also liked it at room temperature. 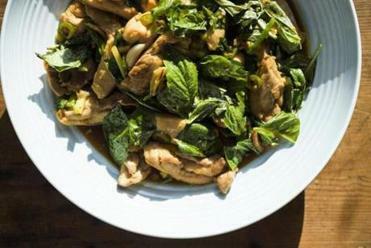 Serve with steamed jasmine rice. Don’t use a conventional skillet. A nonstick coating is key, allowing the omelet to easily slide out of the pan. Also, make sure the skillet is oven-safe, as the omelet finishes cooking in a 400- degree oven. Heat the oven to 400 degrees with a rack in the upper-middle position. In a medium bowl, use your hands to mix together the pork, 1 tablespoon of the soy sauce, the fish sauce, sugar, ginger, and ½ teaspoon white pepper. In a separate medium bowl, beat the eggs, chili-garlic sauce, and the remaining 1 teaspoon soy sauce. In a 12-inch nonstick skillet over medium-high, heat the oil until just smoking. Add the pork mixture and the mushrooms and cook, stirring occasionally and breaking up the meat, until the pork is no longer pink and the mushrooms are tender, about 5 minutes. Stir in the scallions and cook until fragrant, about 30 seconds. Pour the egg mixture over the pork mixture and cook, pushing and stirring from edges to center, until the eggs just begin to set, 2 to 3 minutes. Transfer the skillet to the oven and bake until the top is set, about 5 minutes. Set the skillet on a wire rack and let cool for 5 minutes. Run a rubber spatula around the edge and under the omelet to loosen, then slide the omelet onto a cutting board. Cut into 8 wedges and transfer to a serving platter. Serve with cilantro leaves and lime wedges.